Who doesn't love a game of Tug-Of-War?!? Our 4-Way-Tug-Of-War is a unique twist on this classic game and it will have your guests jumping into the action. 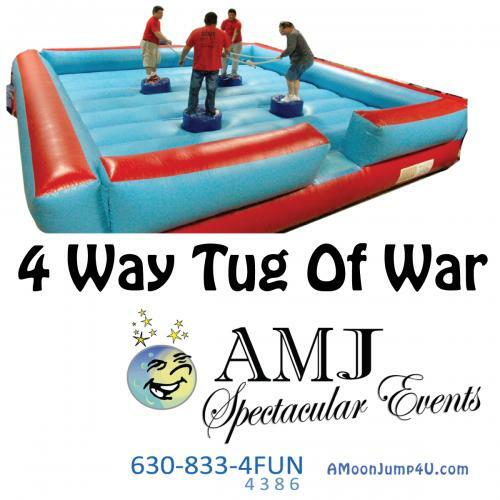 The 4-Way-Tug-of-War is an inflatable arena that features four pedestals for participants to stand on. You have to pull your opponents off their pedestal before they pull you off! The 4-Way-Tug-of-War is appropriate for guests of all ages and will attract both participants and observers! Large birthday parties, school fun fairs, fundraisers, neighborhood block parties, or other large events our 4-Way-Tug-of-War will bring some excitement and fun for all your guests. Let AMJSE take care of all the work - we will deliver, set-up, and take down your 4-Way-Tug-of-War, so all you have to do is enjoy! Contact us now to talk about this, other fun games, or about the hundreds of other rentals we have ready to help make your party a spectacular event!